Using your smartphone as a storytelling tool brings selfies to a whole new level! You ARE the storyteller in your videos and modern smartphones are perfect for letting you be in your videos. In this training you will learn about accessories that make this easy to do! Video recorded with today’s smartphones is of a high enough quality to be used on broadcast networks. Using a smartphone to record news stories means journalists and reporters can get into areas impossible to reach with large crews. 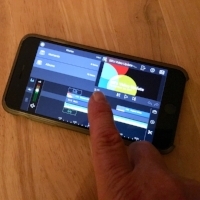 In my Mobile Video Storytelling class you will learn how to use your smart-phone to tell stories through video. Using your smartphone's default camera app, you will learn a method of capturing very short video clips to create sequences that become the building blocks for your storytelling videos. Learn more on the Mobile Video Storytelling page. The Mobile Filmmaking Camp to be held in the Summer of 2018 is a new initiative of the Booz Photography Learning Center. The camp brings all that is included in the Mobile Video Storytelling course plus nine additional hours of fun, hands-on filmmaking activities. Learn more on the Mobile Filmmaking Camp page. The Photography Learning Center website and blog is your place to learn how to take more control of your camera and follow my journey of photography. Students come up with lots of creative ideas for images they want to make. When one knows how to control one's camera, there is then plenty of room to get creative! Even in small classes, one-on-one student help is possible. 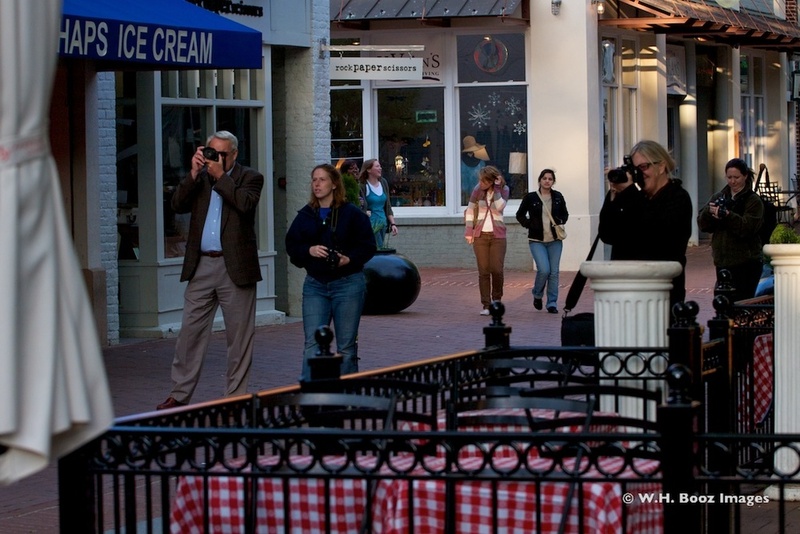 Here I am helping one student while another checks the images she's just captured in a class I held on the Downtown Mall in Charlottesville, VA (USA). In my classes, students put into practice immediately what I help them learn! All learning experiences are at least 90% hands-on with constant instruction. By trying things one learns. Practical and immediate application of what you learn helps to reinforce the learning. Practice takes all shapes and forms. "Chimping" is the term used to describe when people look at the image they just captured on the LCD of their camera. It is not a bad thing because it gives you instant feedback to how the chosen settings worked to create your image. From smartphones and point and shoot, through mirrorless and dSLRs, I will help you get more from your equipment. Want to know why your images shot in "Auto" aren't the way you want them? I've got you covered. Want to know how to use your camera's flash or, even better, an external flash? I have that covered as well. My blog contains posts of how I live with my camera and gear and my web pages provide you with guides to my one-on-one tutoring, the gear I use, and the videos I create to help you. I want to help you become a better photographer. That means practice. Lots of practice! When working with me you are holding your camera in your hands and we are either walking around our yard or your yard, in a nearby park, or on a downtown street. You are putting into practice all the things I teach you right on the spot! Flash photography class in Charlottesville, VA (USA) - pairs of students working on an assignment and helping each other. 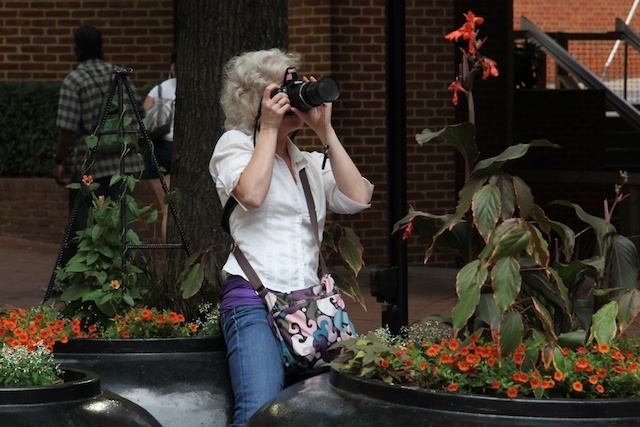 After working on basic techniques and getting an understanding of the Exposure Triangle, I met my students on the Downtown Mall, Charlottesville, VA (USA) and they put into practice what we discussed in class. "Chimping" is not a bad thing! 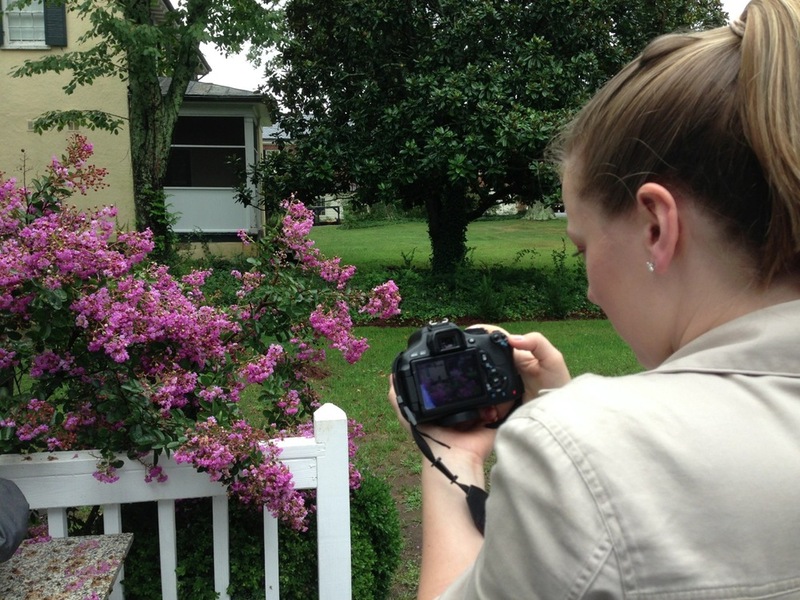 Here one of my tutorial students is practicing what we have discussed about depth of field. This student is checking the results of chasing bees buzzing in our garden's Lambs Ear plants. Practical and real exercises to practice using a fast shutter speed to freeze a busy bee! A water bottle may not seem like an exciting subject, but it is very patient while this student learns how changing his aperture changes what is in focus in his shot! Getting better at making images you love starts with learning how your camera works and how you can control it. Don't let your camera make all the decisions. That's what I help you do by customizing a learning experience that meets your needs. I have created a collection of two-hour "Tutoring Blocks," each with a specific goal and set of activities. By combining the appropriate "Blocks," we taylor learning content that will help you grow in your photographic confidence.